I have always been strongly fond of my birth date. Late August, when summer is perfectly ripe, just before the reality kicks in of back-to-school duties... it's my favorite time of year. Let's be honest: we all feel like summer rushes by us every single year, and the last few weeks are regularly, at least for me, the most memorable. Of course I relish in the crisp months of September and October (changing leaves in Wisconsin, layers of neutral sweaters and cozy jackets paired with leather boots), but in my mind I'm an August girl at heart. If you're wondering where I'm going with this: my birth month is the ultimate inspiration behind how I am choosing to decorate my first apartment this year. I might be belaboring this whole apartment decorating thing by now, but you guys, I really can't help it. Excited is an understatement. After making the big leap to transfer from my small, highly selective, gorgeous ivy-covered campus on the East Coast to the large big-ten school in my home state, I have been trying my hardest to break down my thoughts in attempt to reach the root of why I do what I do and how I make my decisions. Choosing Lehigh as a high school senior was chasing my life-long dream of heading out East to a pretty campus covered in character and charm. Much to my surprise, that didn't turn out to be what I wanted, and needed (clearly). So, if I'm going to make this jump to University of Wisconsin, I am going to go all-in and attempt to make my college experience from here on out as genuinely me as possible. I just so happen to be making that first step within my new bedroom walls. I got some white ruffle bedding a few years ago that now lives on our guest bed, so I have decided to go ahead and just use that instead of attempting to find a new duvet. My dorm bedding last year was for a twin bed and this year I have a full, so I don't think it's totally necessary to find something new right now. You can shop what is pictured above here, which is super similar to what I actually have (the kids version looks identical for $50 less! 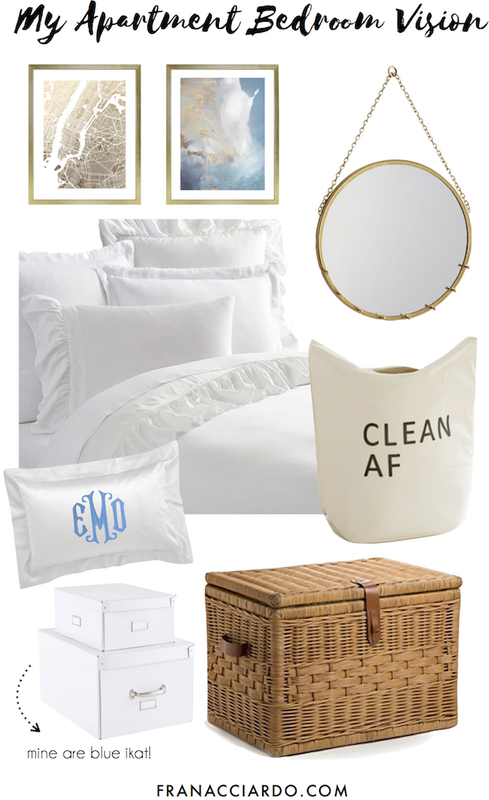 + love this blue and white bedding too) I want to add these monogrammed pillows to pull in the blue and add a little color to the all-white. Adjacent from my bed on the side wall, past the full-length window (yay for bright lighting!!) I want to hang this round mirror with hooks for quick mirror-access and prime make-up lighting. I am sort of conflicted though... would something like this be better for this purpose and the round mirror better for an entryway or hallway? Thoughts?! Across from my bed I am thinking of doing one of three things: framing a large print, hanging photos by clips like this, or doing something cool and unique like this wire grid... any other ideas? Let me know if you guys enjoyed this post!! If so, I can definitely share my vision for our bathroom and living space. Sorry it got a bit long! Love this!! Mine is so similar for my apartment this year except I have accents of purple instead of blue! Hope you have a great school year!